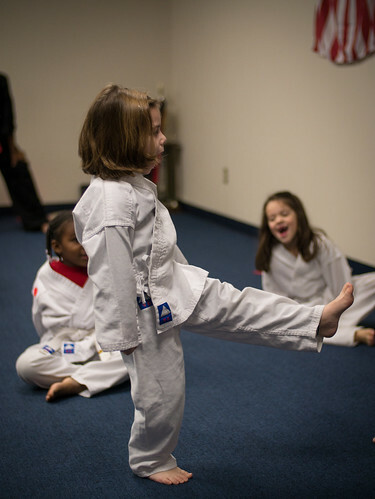 The girls are very much enjoying karate. 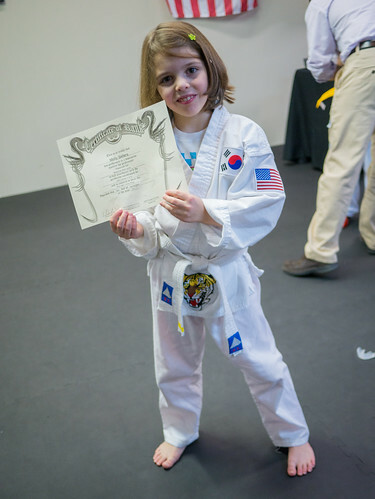 Last week was Molly's first belt test, where she would test to earn a yellow stripe on her yellow belt (note that belt rank may differ from one form of karate to another). 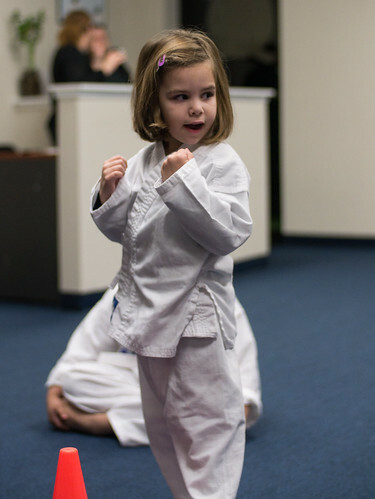 She's been practicing and studying for several weeks, and she was finally ready to test. 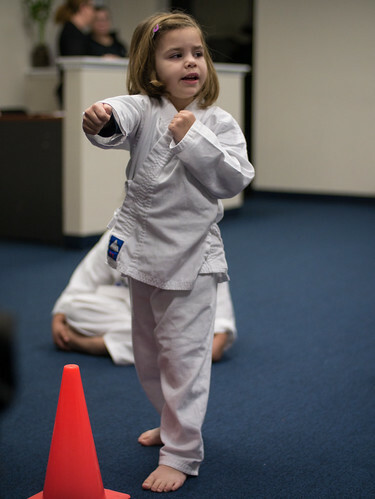 But, first, Leah got to show off her karate skills. 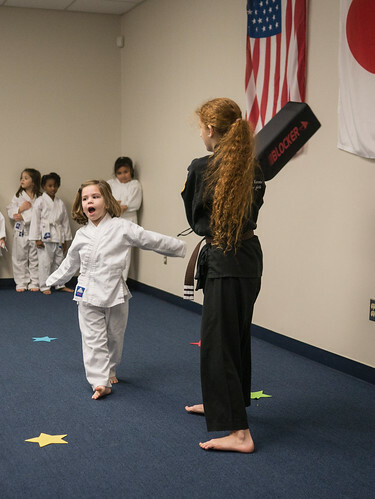 Leah’s karate class is too young for belt tests, but they do have ceremonies to culminate a specific topic they've been working on. 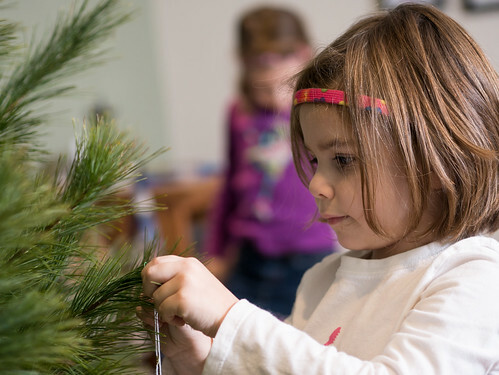 These include demonstrations for families. Molly and I got to watch, but sadly Jen did not. She arrived with us, but then had to turn around and head home when we realized the girls had forgotten their bag with gear and belts (which is why Leah is not wearing her belt). Leah led their initial chant. 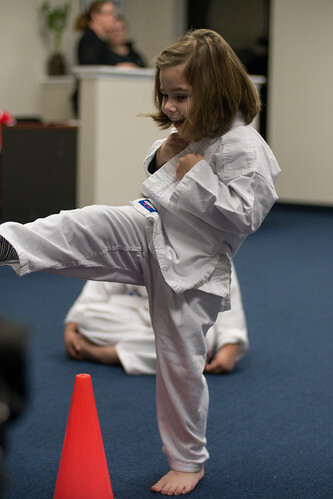 Her kick was so quick, I couldn’t get it all in the picture. 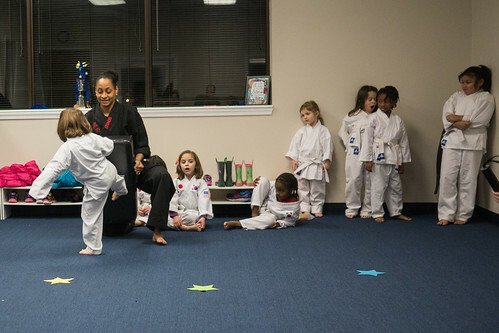 A front kick requires an open mouth. Strutting is important when you block an attacker. When the target is up high, you need to be on your toes to punch. 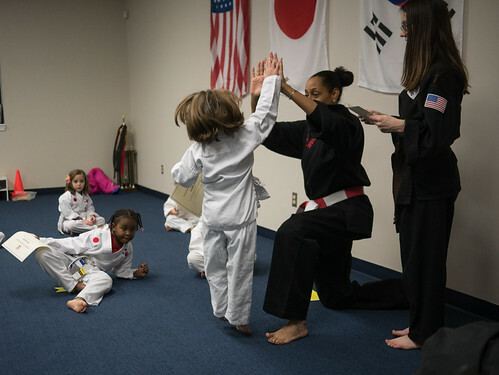 This session focused on balance, and all of them got a stripe for the belt and a certificate, as well as a high five from sensei. 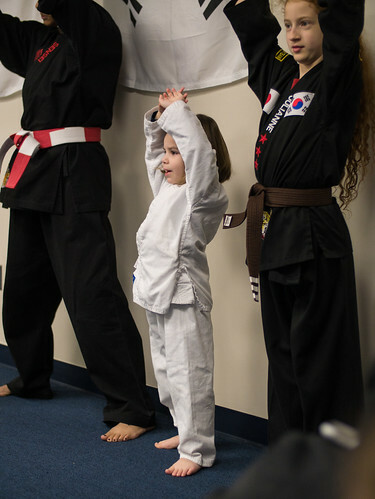 Since Leah was missing her belt, she had to wait to get her stripe until a few minutes later when Jen arrived with belt in hand. Then it was on to Molly's test. 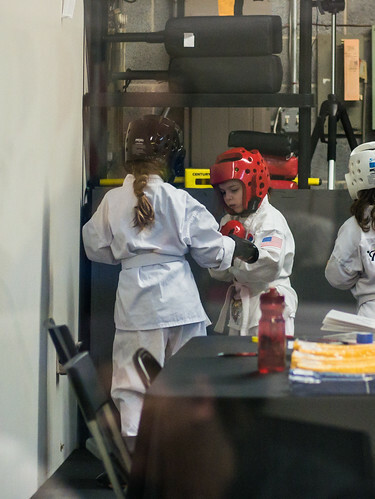 It was intense, including terminology, techniques, katas, kumite (sparring) and something I can only describe as toughness (getting hit in the stomach, sat on while doing a plank, stepped on while on the ground). It lasted over 2 hours. 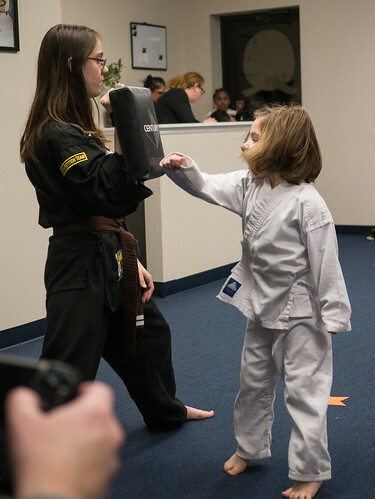 Here’s Molly sparring a bit. Sorry that I don't have more pictures of her, but the place was packed with parents and there's only a little window to look through. 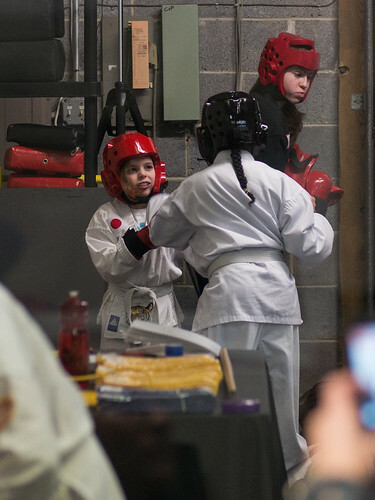 Molly did great and passed the test and earned her yellow stripe. Congratulations, Molly! 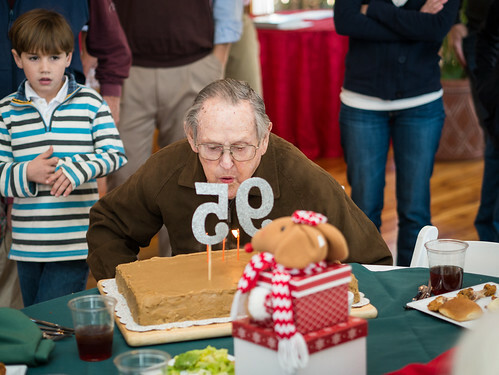 Grandaddy turned 95, and a celebration was in order. Since the girls have school (and we don’t like to skip school) and lots of other activities, we decided to just go for the weekend. 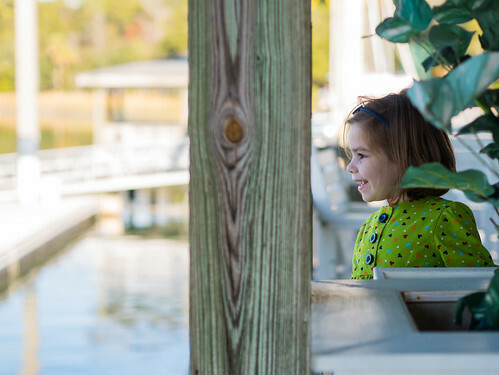 And since flights to Savannah are both expensive and only at difficult times for those of us traveling with kids, we decided to drive. So, we got Molly from school and hit the road. We made it as far as Florence, South Carolina before stopping for the night at a hotel. Then we woke up Saturday morning and went straight to the party which started at noon. 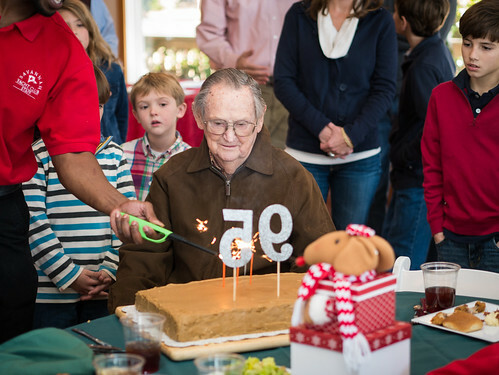 The party was just for immediate family, but Grandaddy has got a lot of immediate family. Someone thought it would be funny to use trick candles that relit themselves. He persevered and got them out eventually, though. 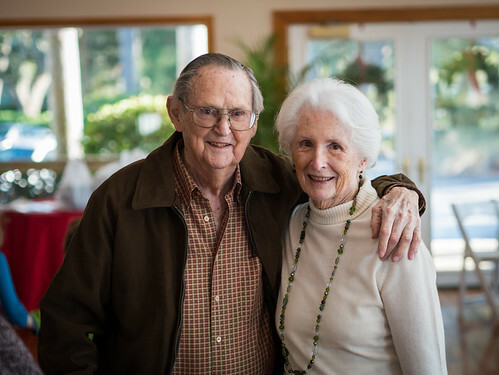 Grandaddy and Betty have had some rough times this year, but they’re still smiling. 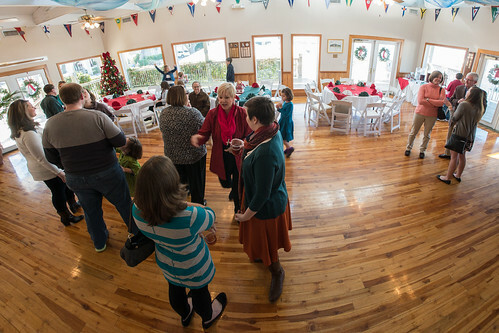 The party was held at the Sail Loft at the Savannah Yacht Club. It’s very nice inside, but outside is even more fun. Water and boats are everywhere. 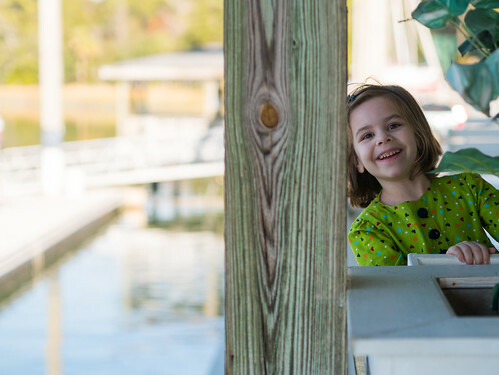 The girls especially liked watching the boat lift put boats in and out of the water. After the party, we stayed the night at Grandaddy’s house. 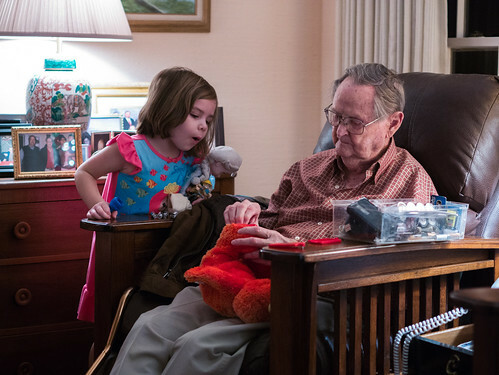 At 95, he’s still fixing his great grandkids’ toys. Then we woke up early the next morning to drive all the way back home. Thankfully, traffic wasn’t bad, so we managed to make it in a little over 12 hours. Just in time to put the girls to bed to get some sleep, as they both had to be up for school the next morning. 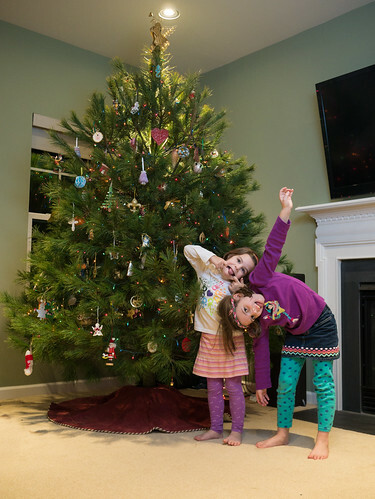 Acquiring the tree was not enough for the girls - they wanted to decorate it as well. 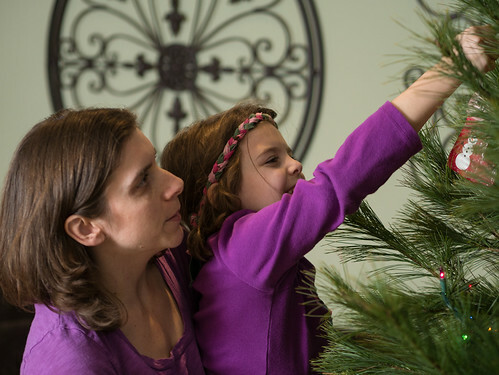 So, we broke out the ornaments and put on the Christmas music. 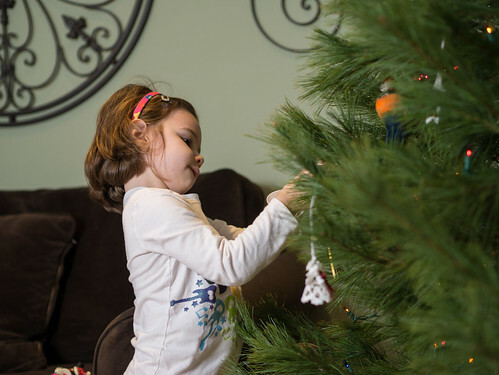 Leah hung the first ornament. 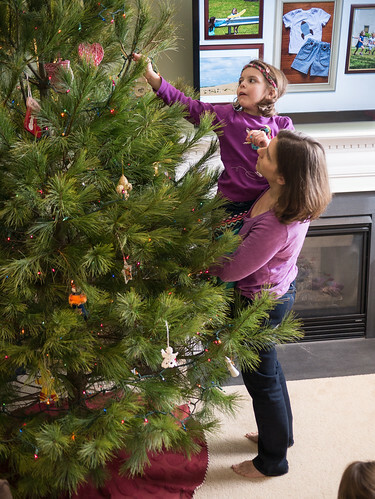 Trying to avoid having all the ornaments along the bottom of the tree, Mommy gave Molly a bit of a lift. And a bit more of a lift. And my shoulders get them even higher. 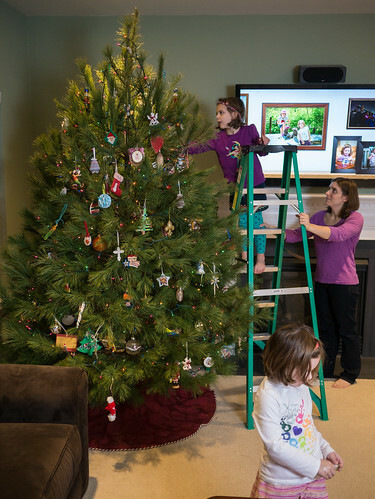 Eventually, parent ladders give way to real ladders. Leah wasn't up for climbing up high, but Molly was happy to. 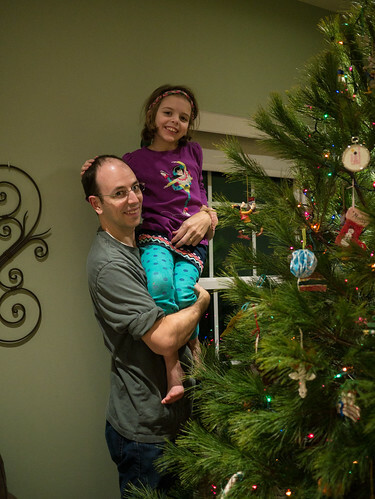 I still do the angel on top, as long arms are required. 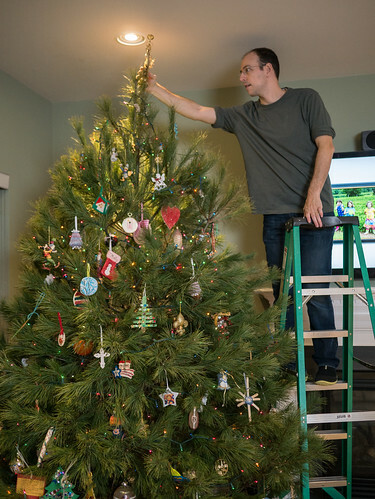 Here’s the tree, fully decorated. Oh, and some goobers in front of it. 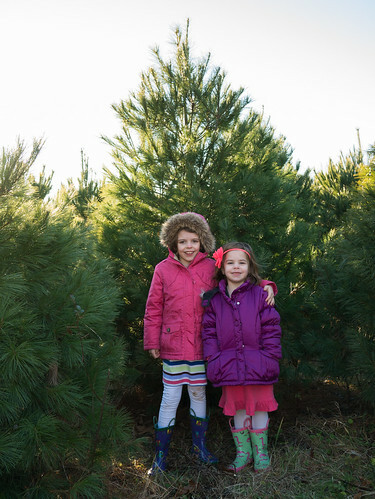 Again this year we headed to Greenway Farms to cut down our Christmas tree. They have lots of trees to choose from and cut down yourself. This year we also tried out the pit beef, which was quite good. Sadly, the hay ride was not running since the ground was so wet from the rain the day before. 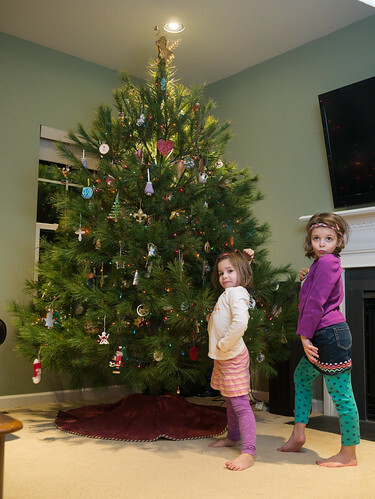 Before picking our tree, we had a photo shoot. 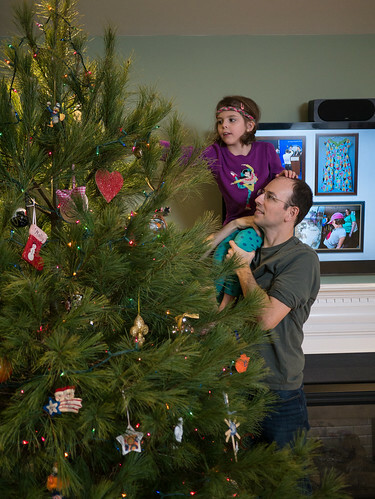 For our Christmas card picture this year, Jen decided she wanted something among the Christmas trees. 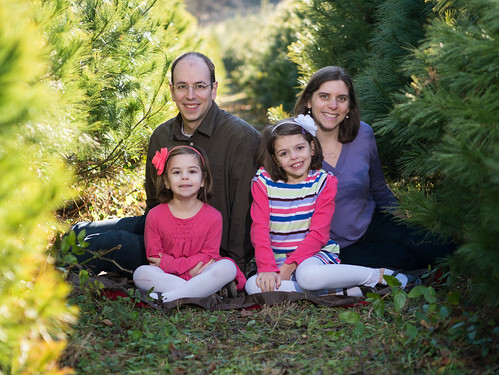 So, we set up a makeshift photo studio amongst the rows of trees. 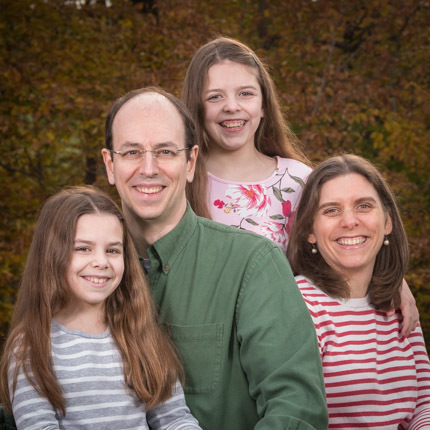 Between camera, tripod, Wi-Fi remote, external flash, wireless flash trigger, flash stand, and my hat as a make-shift lens hood, we got the shot. Then we packed up the photo gear and walked the rows of trees to find the perfect one. 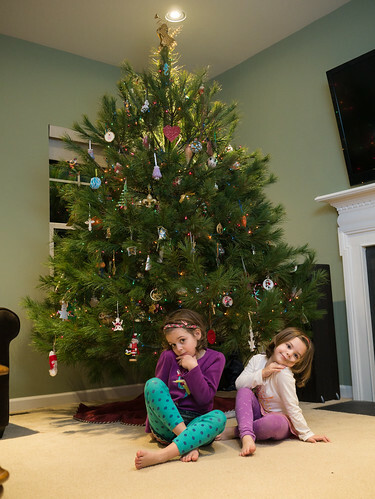 Here are the girls with our chosen White Pine before cutting it down. We’ve done a lot of painting around here lately. First, we painted our main level bathroom, then our bedroom, and finally the girls’ bathroom. The girls were excited to help on the latter two. As usual, they tired quickly, but were enthusiastic while they lasted. They even came up with a song. Three weeks later, when we painted their bathroom, the song had changed slightly. 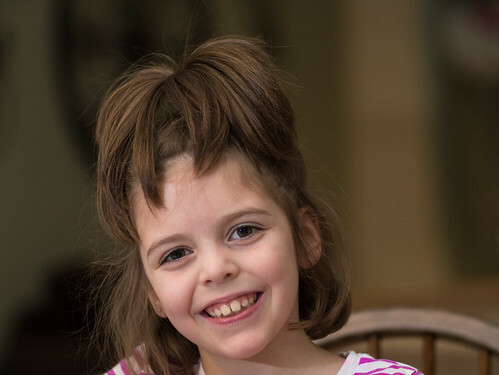 And, in case you were wondering about Molly’s hair in that video, here’s a picture of her crazy updo. She needed her hair up to keep it out of the paint, but Mommy went beyond the usual ponytail this time. We’ve had a lot of singing around here lately. First, Molly sang with her choir in church. Note that in her new older kids’ choir, she even has music in a fancy folder to read off. The next week, Leah sang with her choir. Lastly, the girls were a part of our church's Walk to Bethlehem. They were part of the heavenly host, and got to sing Gloria for each group that passed by. It was raining, so they wore ponchos over their angel outfits. Leah wouldn't go out without Jen, so Jen joined in the fun as well.